OK This is a joke folks, not a real magazine. A.B. Shuman and I were kidding around and the seed of the idea started there. Chuck Caswell was the one who came up with Lemmings Motor News. I hired illustrator Joel Naprstek to do the art and Photoshop whiz Gary Fulkerson to lay in the blurbs. The 1932 Ford is obviously the most beautiful car ever discovered by hot rodders and is unquestionably the classic king of street rods. Unfortunately when you go to the Street Rod Nationals and see 2,000 1932 Fords, your mind gets jaded (bored, no longer interested in something because you have been overexposed to it). The same thing happens when you stand by the gate where the cars roll in at the LA Father's Day Swap Meet and Roadster Show in Pomona. It seems that 4 our of every six cars that roll in are '32 highboys (OK I'm exaggerating). To me the whole idea of having a hot rod is to have something that is unique and at the same time looks good. To me, cookie-cutter, belly button, insert Tab A in Slot B carbon copy, lookalike rods that are a Xerox of a Xerox of a Xeroz of a car that was created 70 years ago is not unique. I've always felt that the Pro Street trend and the Billet trends in street rodding were stupid, overly expensive and wasteful. Everybody jumped on it because they all wanted the new "hot" trend in rodding to be on their car. Satire is a technique of ridiculing a subject, often intended as a means of provoking change. The whole point of SHEEP RODDER is to stimulate people to use that large organ located in the top of their skull to come up with new, creative, fresh ideas for rods. Today it seems every rodder is focused on the past, recreating the past, bringing back cars from the past. That's all well and good, and certainly better than billet or pro street, but how about looking ahead in time rather than back? Certainly the Zephyrs and Boattails we are creating at DECO RIDES are looking back and copying cars from the past, but we like to think that like Chip Foose, we're looking ahead in time and creating new and different shapes. Combining components like replica Bugatti grille shells with copies of 1937 Figoni & Falaschi Delahaye fenders on a cut down Auburn Boattail inspired body is likewise looking ahead. 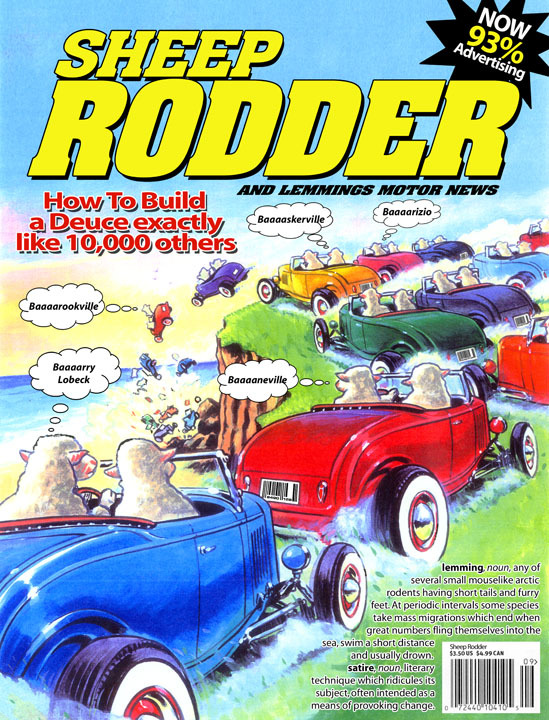 So that's my whole motivation for SHEEP RODDER, to inspire and encourage builders and designers to have the cajones to follow their dream and do something different. All I ask is that it ends up looking good, rather than grotesque.